Distillation is still the most used separation process in the chemical and petrochemical industry. Simulation programs provide a larger variety of possibilities for process synthesis, design and optimization. However, the quality of the results obtained with these programs depends on the quality of the models and model parameters used. In some cases the results based on calculations using group contribution methods might be sufficient. In other cases the exact knowledge of the phase equilibrium of the involved components is indispensable. In these cases exact experimental data and a good description of them with the used thermodynamic models ought to be aspired. We deploy several apparatuses to measure the VLE data using static or dynamic and synthetic or analytic approaches. Each experimental setup has its special advantages, preferences, and its own range of applicability. In the following numeration the different methods are suggested and explained in detail. For the measurement of phase equilibrium data (vapor-liquid equilibria, gas solubilities, dew points, critical data, etc.) at higher pressures an equilibrium cell with or without direct GC sampling, for x, (y,) T, P data can be used. The cell is made of titanium or Hastelloy C-276 equipped with two Sapphire windows (see following figures). 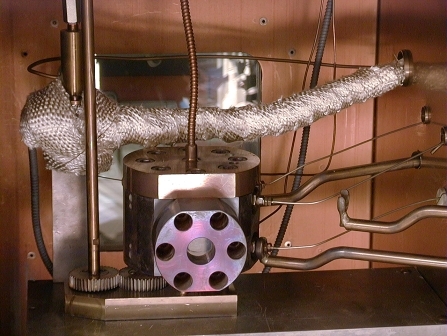 The apparatus can be applied up to temperatures of 400 °C and pressures of 400 bar whereby the sapphire windows allow a look inside of the cell. The equilibrium cell is thermo-regulated in an air thermostat and can be charged with known amounts of substances. In case of purified and degassed liquids or liquefied gases this can be performed using by piston injector pumps which allow the precise recording of volume differences. Gases can be injected using a thermo-regulated gas bomb of known volume. At a certain pressure the amount of gas inside the bomb can be calculated using the PvT behavior of the gas. The injected amount of gas can then be obtained from the pressure difference in the bomb before and after each injection. Solid substances can by directly weighed into the cell and degassed by evacuation of the cell. The pressure inside the cell is monitored with an oil filled membrane pressure transducer system and a calibrated pressure sensor. The temperature is measured with a Pt100 resistance thermometer inside the metal body of the cell. Using the optional GC sampler samples can be withdrawn from the desired phases and analyzed by gas chromatography after equilibration and phase settling. With this method small amounts of the substances are directly injected into the carrier gas stream using pneumatically driven micro samplers (ROLSI: rapid on-line sampler-injector). In this set-up two micro samplers are installed. One capillary is placed in the upper region (for vapor phase sampling) and one at the bottom of the cell (for liquid phase sampling). Because of the very small sample size the equilibrium inside the cell is not disturbed. In order to avoid condensation and adsorption of high boiling components, the micro sampler and the lines for the gas stream of the gas chromatograph are superheated. To enable the sampling, the pressure inside the cell has to be larger than the pressure of the carrier gas stream of the gas chromatograph. For this purpose, at low system pressures an inert component (helium) can be added to the cell. A computer operated static apparatus (see below) was used for the isothermal VLE measurements. In this procedure the pressure of different overall compositions is measured at constant temperature. It can be operated at temperatures between 278 K and 420 K and pressures up to 2 MPa. The thermostatted, purified and degassed compounds (liquids or liquefied gases) are charged into the VLE cell which is evacuated and placed in a thermoregulated oil bath. The pressure inside the cell is monitored with a calibrated pressure sensor (model PAA 25 HTC, 0-20 bar, Keller) and the temperature is measured with a Pt100 resistance thermometer (model 1502A, Hart Scientific). The total compositions are determined from the known quantities of liquids injected into the equilibrium cell by stepping motor driven injection pumps and valves. The liquid phase compositions are obtained from the total compositions by solving mass and volume balance equations which are also taking the vapor-liquid equilibrium into account. For analytic VLE or VLLE measurements (isothermal x,(x’,) y,P data) a magnetically stirred equilibrium cell made of Hastelloy C-276 can be used. 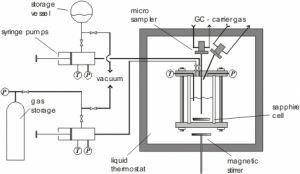 This set-up can be applied for the experimental determination of phase equilibrium data as V(L)LE or gas solubility data at temperatures of about 240 to 470 K and pressures up to 10 MPa. The thermoregulation of the cell is performed with a metal jacket heated electrically or with an external liquid circulation thermostat. The pressure inside the cell is monitored with a calibrated pressure sensor, and the temperature is measured with a Pt100 resistance thermometer inside the metal body of the cell. In this device, known quantities of substances (liquids, liquefied gases, or gases) can be injected into the cell using piston injector pumps or gas storage containers, respectively. Moreover, after equilibration and phase settling samples can be taken from the phases and analyzed by gas chromatography. Therefore, small amounts of the substances are directly injected into the carrier gas stream using a pneumatically driven micro sampler (ROLSI: rapid on-line sampler-injector). The complete cell can be turned so that the cusp of the sampling capillary is immersed in the desired phase. For this purpose, the cell is equipped with borosilicate glass or sapphire windows which are sealed with PTFE. Because of the very small sample size the equilibrium inside the cell is not disturbed. In order to avoid condensation and adsorption of high boiling components, the micro sampler and the lines for the gas stream of the gas chromatograph are superheated. To enable the sampling, the pressure inside the cell has to be larger than the pressure of the carrier gas stream of the gas chromatograph. For this purpose, at low system pressures an inert component (e.g., helium) can be added to the cell. 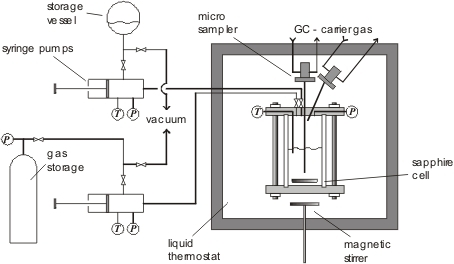 The VLE measurements at low temperatures can be performed with the help of a stirred equilibrium cell (volume about 60 ml, see figure below) consisting of a sapphire tube is mounted between two Hastelloy C276 flanges. 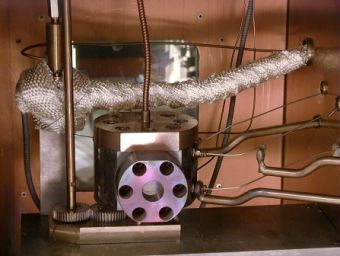 This experimental set-up can be at temperatures of about 200 to 470 K and pressures up to 10 MPa. In this case, two pneumatically driven micro samplers, one with a long capillary to enable sampling of the liquid phase and one with short capillary for the vapor phase, are installed at the top of the cell. For the pressure measurement a pressure sensor is connected to the cell. The pressure sensor was calibrated with a pressure balance at different temperatures, before. The temperature is measured directly in the cell using Pt100 platinum resistance thermometers. In this device, known quantities of substances (liquids, liquefied gases, or gases) can be injected into the cell using piston injector pumps or gas storage containers, respectively. Moreover, after equilibration and phase settling samples can be taken from the phases and analyzed by gas chromatography. Therefore, small amounts of the substances are directly injected into the carrier gas stream using pneumatically driven micro samplers (ROLSI: rapid on-line sampler-injector). Because of the very small sample volume (e.g. < 0.1 μl) the equilibrium inside the cell is not disturbed. In order to avoid condensation and adsorption of high boiling components, the micro samplers and the lines for the gas stream of the gas chromatograph are superheated. In order to enable the sampling, the pressure inside the cell has to be larger than the pressure of the carrier gas stream of the gas chromatograph. For this purpose, at low system pressures an inert component (e.g. helium) can be added to the cell. Isobaric VLE data can be measured by means of a dynamic method using a Swietoslawski ebulliometer as described by Rogalski and Malanowski, Fluid Phase Equilib. 5 (1980) 97-112. At a given pressure, which is regulated by an electronic/manual pressure control, the boiling temperature of a mixture can be measured. When phase equilibrium is reached, i.e. 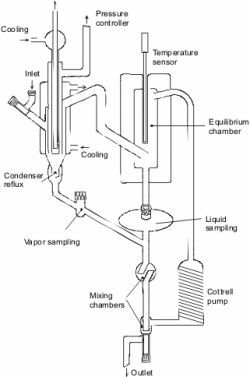 a stable circulation is achieved and the boiling temperature is constant, the concentrations of both phases can be determined by taking samples from the liquid and the condensed vapor phase and gas chromatographic analysis. The following figure shows a scheme of the device.